The season is upon us, and now is not the time to ignore your business—especially your listings—but rather, a great time to make it stand out. That said, here are a few tips to help infuse your staging, listing photos and open houses with a bit of holiday spirit to grab the attention of potential buyers. Just remember: Run your ideas by your seller and don't go overboard. You want to attract buyers, not push them away! 1. Depersonalize it. 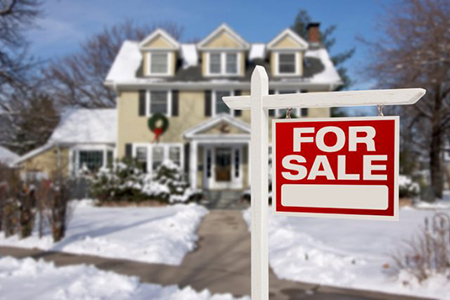 Whenever showing your seller's house, the general rule is to keep personal information about them out of sight. Holiday photos and personalized decorations, like pictures from the family hay ride or Christmas stockings with the kids' names on them, should therefore be stored during showings. 2. Simplify it. While highlighting the holiday season, to draw positive attention to your listing, you want to ensure the property itself is the main attraction. You don't need to fill the home with an abundant amount of colored lights, tinsel and trees to make it look festive. A few red, silver and gold touches can generate that same holiday feel without being obnoxious. 3. Keep it classic. A simple wreath on the door or garland over the fireplace will be more universally appealing than an inflatable Santa or life-size Nativity scene. To appeal to more buyers, minimize or eliminate overtly religious symbols. 4. Accentuate positive features. A bland mantle can look impressive with the right decorative touches. Bay windows can be accentuated with the right seasonal color scheme. A simple staircase can turn into a must-have feature if you present it right. Use seasonal decorating to draw attention to the details that make your listing different from others on the market. 5. Sometimes a holiday scent is all that is needed. Winter wick potpourri, freshly baked cookies, scented pinecones, pine-scented air fresheners…there are many ways to create a seasonal scent. Just try not to overwhelm visitors. The fragrance should be a pleasant background effect, not a nasal assault. Do you find yourself spending valuable time and resources marketing your listings without really knowing what you're getting in return? How many of your leads are calling because of listing flyers you left at a new listings? How many picked up your card at an open house? If you aren't sure what effect, if any, your marketing is having on your business, the Holiday Marketing for Real Estate eBook can help. Patty McNease is director of Marketing for Homes.com. For more information, please visit marketing.homes.com.